About Product : She surrounds herself with many but still by none... weaving her thoughts loud & clear within these folds ... She is a madhouse walking with elegance circling herself with an aura of her own... This is not just a sari, it is a reflection of her unapologetic spirit flaunting styles strong & poised. Sunset at the great Narmada, the stepped ghat dotted with small temples, flickering diyas floating downstream in prayer, the river glowing a flaming golden… Behind the ghat stands tall, the fort of Ahilyabai, who was the queen of Malwa in the 18th century. A devout worshipper of lord Shiva, the righteous queen not only gave the people many a great temples, but also a beautiful textile that is adored by women even today. 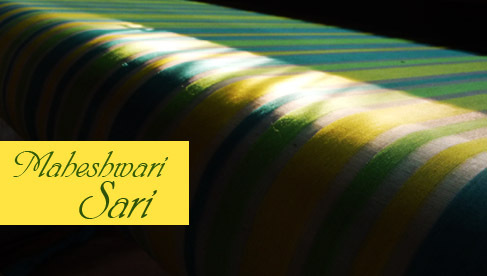 The beautiful textile gets its name from Maheshwar, where it is made. 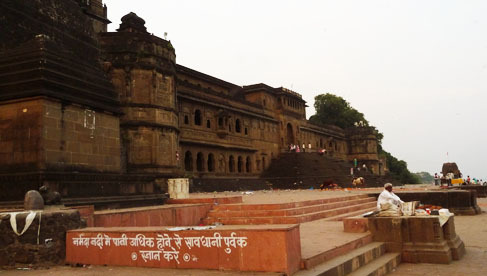 This ancient town situated at the banks of river Narmada even finds mention in the Puranas as a place of great religious importance and is now also synonymous with the beautiful weaves created here. 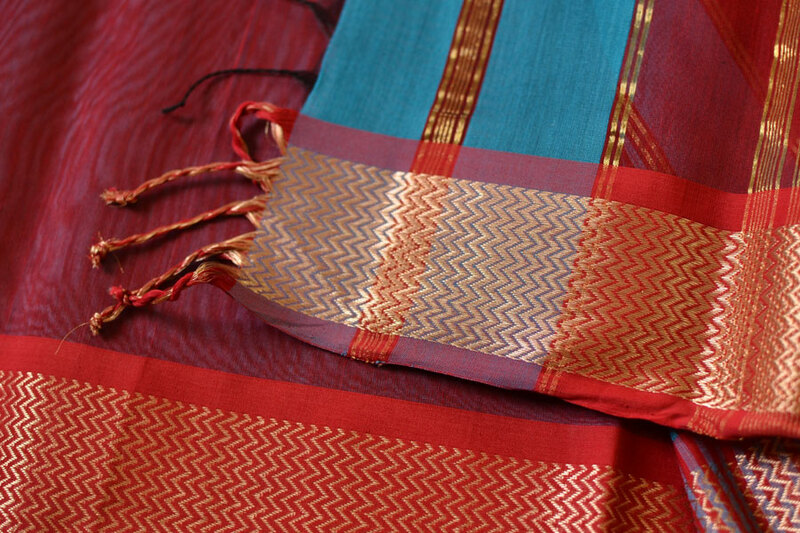 The Maheshwari sari, a favourite among women of all ages, was also designed by a woman. 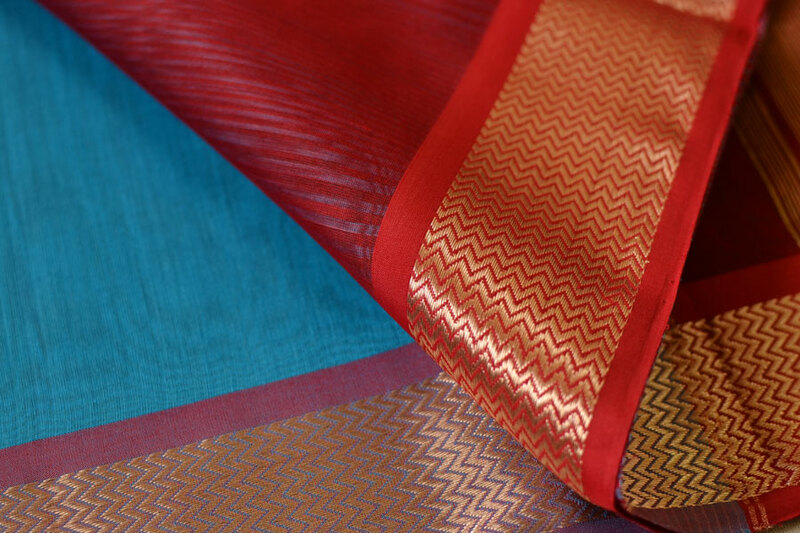 For making fabric for the royalty, queen Ahilyabai brought weavers from Surat and designed a unique sari, with motifs inspired by the local architecture and a striped Pallav. It was, and remains, an exemplar of graceful simplicity, yet refined and sophisticated. 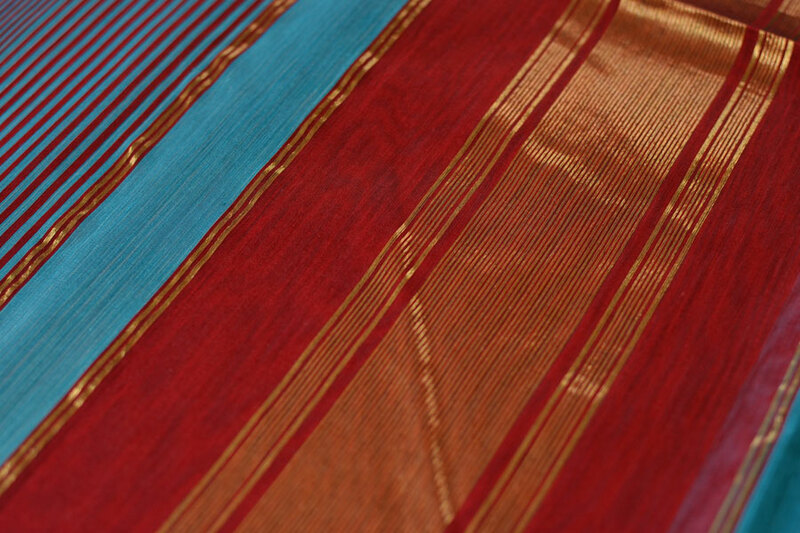 The understated elegance of a Maheshwari sari is complemented by the subtle attributes that make it different. 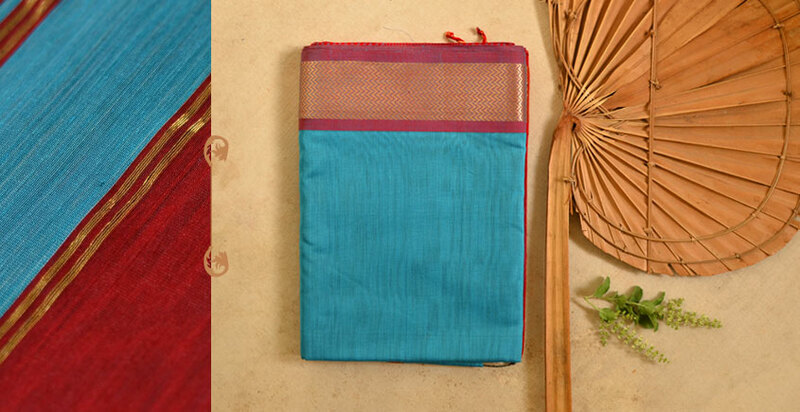 The Maheshwari sari has areversible border, so it can be worn on both sides. It also has a unique pallav with five stripes, two white and three coloured ones, alternating. The sari is usually plain, or has stripes or checks in its field, with geometric motifs decorating the borders. The motifs are usually fine abstract representations of local elements like flowers, leaves, and the local architecture. With fine cotton yarns in its weft and silk in the warp, this fabric islight and airy for the summers, yet has the subtle luster of silk. 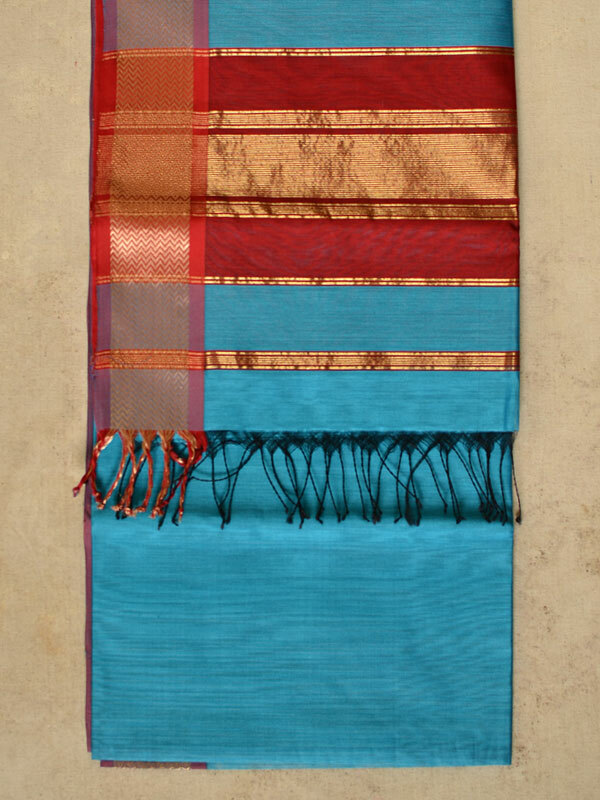 The Maheshwari sari is not made by one person or one community, but the entire town is involved in this craft in some way or another. This craft weaves Hindus and Muslims, men and women together in its sublime fabric. 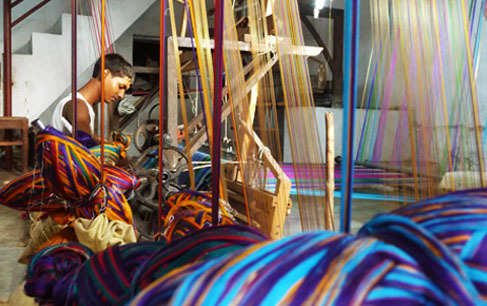 The dyers colour the yarns in rich colours after which a silk warp and cotton bobbins for the weft are prepared. 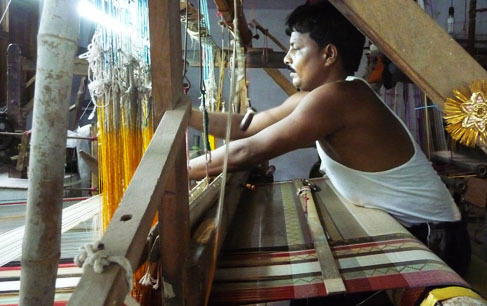 Once the loom is set with the patterns for borders and motifs, the weaving starts. 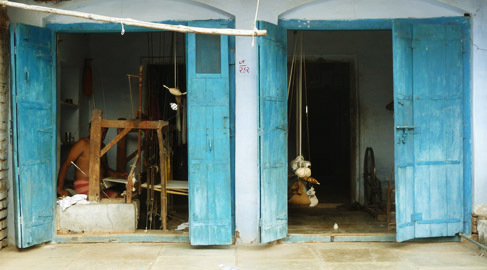 In the weavers’ colonies, every street is filled with the continuous clacking of wooden looms; the craftsmen are busy creating poetry in colour. Through the years, this craft has seen many changes, many highs and lows.Copper coated nylon has replaced the pure gold wires of zari and synthetic dyes have replaced the limited palette of natural colours. 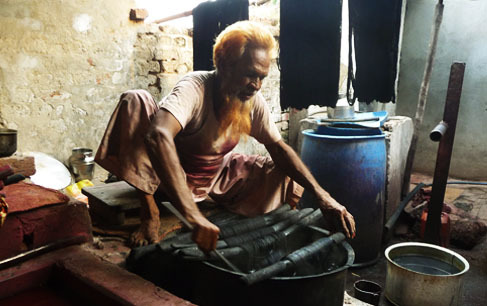 Withhigh demands and extreme pressures on time, dyers have to get one warp of silk ready within an hour, leaving little room for revival of slow natural dyeing. 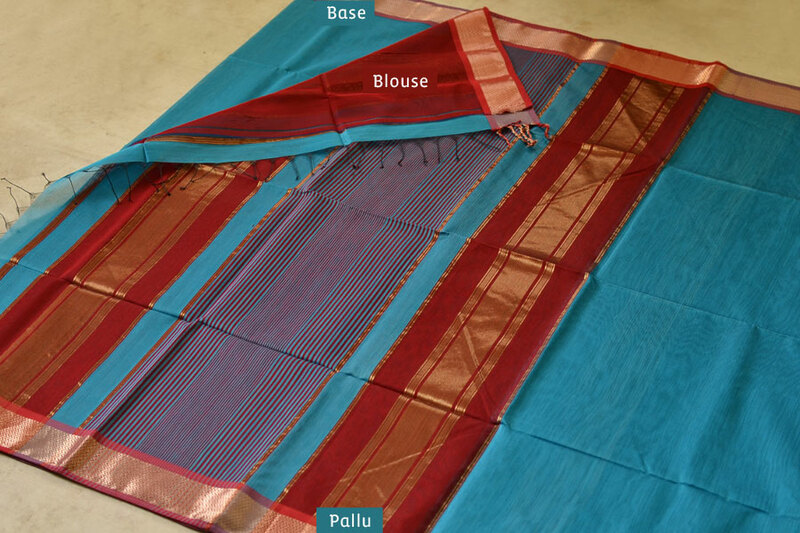 There are only a handful of craftsmen who weave the original striped designs of the sari, which had a typical Marathi look, and these are popular in Maharashtra. Marathi turbans in Maheshwari weaves were also popular once, but the demand fizzled a few decades ago. However, the craft prospers today without losing its characteristic airy lightweight quality. Keeping with the times, the designs are changing and the weavers are creating Maheshwari dress materials and furnishings for a global reach.